The greenhouse is one of the additions you can build as a west wing extension to the main hall of your home. The greenhouse offers the opportunity to grow food and ingredients in up to 18 plots of fertile soil. 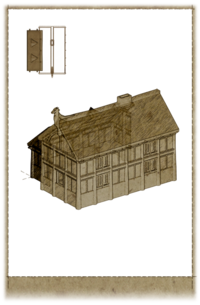 The following is a list of furniture items and decorations which can be added using the carpenter's workbench in the greenhouse. It is not necessary to purchase or build all furnishings; you can pick and choose. All items are created in a predetermined location, and only standard items can be moved. Often, a furnishing option includes several pieces of furniture, containers, and/or accessories, but is named for only the primary piece. A number of miscellaneous items are added with various furnishing options, but only notable items are specified on this table—specifically, usable containers and ingredients. Although other common items are added to your home, they are not listed here. Barrels Sawn Log, Nails, Iron Ingot Three barrels and two sacks on north wall. Adds growth of imp stool. Barrels Sawn Log, Nails, Iron Ingot Three barrels and two sacks on south wall. Adds honey. Cupboard 2 Sawn Log, 4 Nails, Iron Fittings West wall, north of center. Adds two satchels. Cupboard 2 Sawn Log, 4 Nails, Iron Fittings West wall, south of center. Adds two satchels. Display Case and Cupboard 2 Sawn Log, 4 Nails, 2 Hinge, Iron Fittings, 2 Glass West wall, south side. Display Case and Cupboard 2 Sawn Log, 4 Nails, 2 Hinge, Iron Fittings, 2 Glass West wall, north side. Display Case 2 Nails, Sawn Log, Hinge, Glass South wall. Adds growth of Namira's Rot beneath it. Night Tables (2) 2 Sawn Log, 4 Nails East wall, north side. Adds two garlic and one grass pod. Night Tables (2) 2 Sawn Log, 4 Nails East wall, south side. Adds one dragon's tongue and one creep cluster. Tall Shelf 2 Nails, Sawn Log, Hinge, Glass North side. This is actually a large Display Case that's mislabeled in the menu, rather than a "shelf". Wall Shelves (4) 2 Sawn Log, 2 Nails Along west wall. Adds a strong box and a honeycomb. Mounted Goat Head Leather Strips, Goat Hide East wall, north side. Mounted Mudcrab Leather Strips, 2 Mudcrab Chitin East wall, south side. Mounted Mudcrab Leather Strips, 2 Mudcrab Chitin West wall, north side. The following food and ingredients can be planted in your greenhouse or exterior garden. Food or ingredients added by official plug-ins cannot be planted. You can plant the item of your choice by activating a particular plot of fertile soil. A "Give Gift" inventory menu will come up with the eligible items you are carrying. You only need to use one of the selected item (if you choose more, it will display a message and remove only one from your inventory), and you may plant multiple plots of the same item if you prefer. If you accidentally plant something in a plot when you wanted to plant something else, simply activate the same plot again; if nothing has started growing, then the first item you planted will be placed back in your inventory and the new chosen item will be removed and planted. If you decide to change your mind about what to grow in a particular plot after something is already growing, a message will be displayed to notify you that something is already growing, and you will be given two options: "Do nothing" or "Clear planter". If you choose the latter, the soil will return to its original state and you can begin again. Food and ingredients harvested from garden or greenhouse plots will produce between 2 and 5 samples every time they are harvested. The amount for each plant is shown on the list below. Player-planted plants may have different appearances than wild ones. When the greenhouse is complete, hanging moss will grow on several rafters, and a beehive will appear on the ceiling at the southeast end of the room. There will also be numerous bees, butterflies, and torchbugs flying around the room. A bird's nest appears on one of the rafters as well. Note that to be considered "complete", you must plant something in every plot in at least one large planter. For example, planting four (out of four) ingredients in a large planter will cause hanging moss/a bird's nest/beehives to appear directly over and around that planter once the ingredients have grown, affecting that "section" of the room, even if the rest of the room isn't fully furnished. Just building all the options at the workbench is not enough. Once the beehive appears, bees may fly around the rest of the house. The three ingredients that may be planted in the garden which produce the single most valuable potion are Creep Cluster, Mora Tapinella, and Scaly Pholiota. The second most valuable is Blue Mountain Flower, Glowing Mushroom, and Nightshade. The most valuable combination based on one plot per ingredient is the third most valuable singly, which is Dragon's Tongue, Fly Amanita, and Scaly Pholiota, as these ingredients allow for four potions where the previous combinations only allow three. Overall, using either the greenhouse and the garden, or just the garden, creep cluster, mora tapinella, and scaly pholiota produce the highest profits. With the greenhouse, thirteen plots should be assigned to mora tapinella and eight to each of the others. With just the garden, five plots should be assigned to mora tapinella, and three to each of the other two ingredients. This allows for 39 and 15 potions respectively, giving minimum profits of 15k and 5.8k gold respectively. In the Special Edition there is a bug with creep cluster. Therefore dragon's tongue, fly amanita, and scaly pholiota become the most profitable combination. With the greenhouse, scaly pholiota should be assigned eight plots and the other two given ten plots each. With just the garden, three plots should be assigned to scaly pholiota and four to each of the other two ingredients. This allows for 40 and 15 potions respectively, giving minimum profits of 13k and 4.9k gold respectively. When harvesting plants in the greenhouse you may not receive the quantity which appears on-screen. ? After the beehive appears in the southeast corner of the ceiling, moving north past a certain point will cause the beehive to visually disappear. It will reappear when you move back to the south. Placing items in or closing a display case may freeze the game. After all the planters have been constructed, any followers who enter the Greenhouse may randomly teleport around the room, sometimes appearing right on top of the player's location. If multiple items are accidentally planted in a single plot, you will receive an error message indicating that only one item may be planted in each plot. However, the stack of items will not be returned to your inventory, and are essentially lost. ? The doors for the Greenhouse do not appear after construction. ? In the Special Edition, creep cluster plants are misaligned when grown. They can be extremely difficult to harvest, and usually not at all. The harvest box appears about a foot above the plot, but can only be activated from about two yards away. If you move closer it cannot be seen. This box will only appear once, if you leave the cell or even reload an older save it will disappear and a new cluster must be planted in order to grow more. They can be harvested most easily from the side of the planters at either end of the greenhouse as they stick out the side. This page was last modified on 16 August 2018, at 18:36.